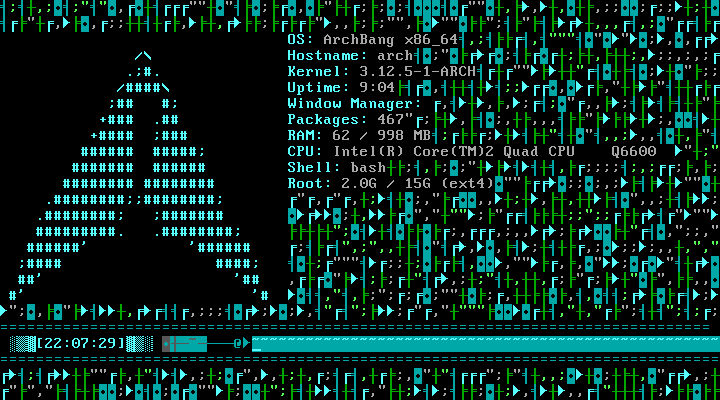 Can the empty spaces/background in a terminal be replaced with a random(but pretty) pattern of ASCII characters? There are many ways to colorize the terminal and shell environment. 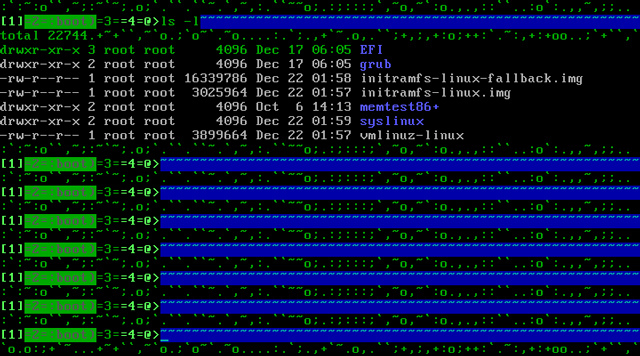 The output of individual commands, such as ls and grep, can also be colorized. Not directly related but interesting nonetheless is the notion of playing media at the console but this seemingly relies on some framework (libraries) on top of the windowing system. The following question is geared solely at the bash shell and its implementation in the Linux terminal framework and its underpinnings. These are not randomly generated scenes. The segments I've selected all actually depict some form of "grassland" terrain (trees, bushes&shrubs, flowers, grass etc.) from a game that uses ASCII characters to represent such objects. 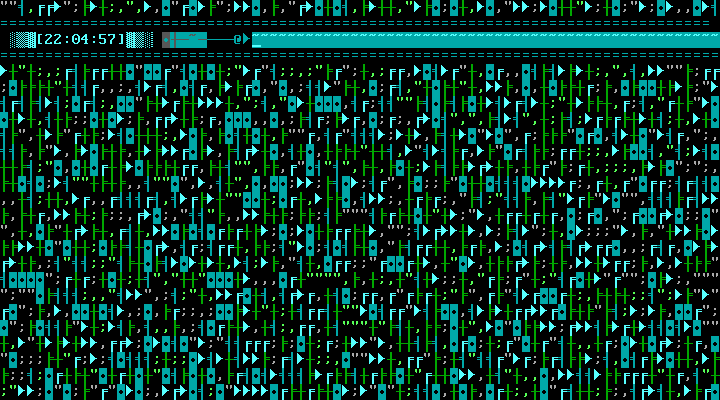 The last 4 scenes showcase user made tilesets which are basically a remap of ASCII characters with color specs (such details are trivial - suffice it to say that this is the visual inspiration for what I'm trying to accomplish here in terms of visuals and "pattern"). I still don't conceptually grasp what are those empty/blank/background "spaces" that I didn't type when I use the console i.e. "what are they made of?" so to speak. Especially those that are not at the prompt, and which wrap around the commands that are echoed. In respect to what happens on the active line, it is possible to demonstrate that bash acts in a "line-oriented" way and that some operations trigger a clearing of the active line (for i in $(seq 1 $(expr $(tput lines) \* $(tput cols))); do echo -n M; done; tput cup 15 1, then at the prompt type a char and backspace it - demonstrated a contributor) - the extent of which may vary from a CLI to another i.e. zsh. Furthermore, it seems when I add something like \[\033[44m\] to my PS1 line in bash.bashrc I get a blue background after reloading bash - so obviously I know that there is some leverage here over of the output appearance insofar as the background is concerned. But I also know that bash is a piece of software relying on some other facility in the form of the TTY subsystem for bringing things to the screen - and this goes down from there to the VT component in the kernel I assume. pstree -Ap on Arch shows systemd linked to login and then to bash. As it stands, many capabilities can be leveraged from the terminal framework and it is basically those features which are exposed in the bash.bashrc configuration file insofar as the prompt is customized by setting the PS1 variable. Control and escape sequences are used to basically interrupt the flow of character displaying in the terminal in order to supply functions, including moving the cursor and other capabilities described in the terminal information database. Many of those functions are passed in using the well known ESC[ (or \33) Control Sequence Introducer (more sequences here and here, and some examples). Furthermore, it is also possible to use the tput utility directly on the CLI to change some terminal properties; for instance tput setab 4 will have bash echo commands on a blue background. 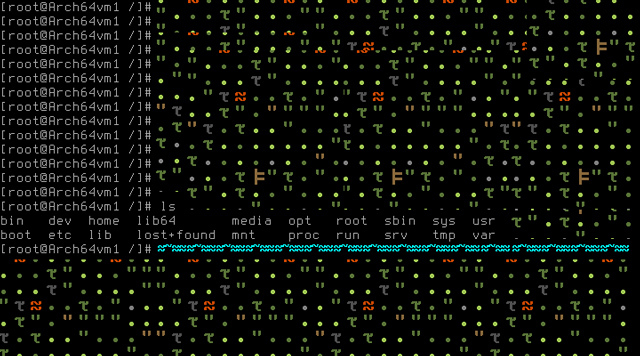 This provides context for the question Can the empty spaces/background color in a terminal be replaced with a random(but pretty) set of ASCII characters? but gives no idea of how to implement the features or of what I'm looking for in the terminal. 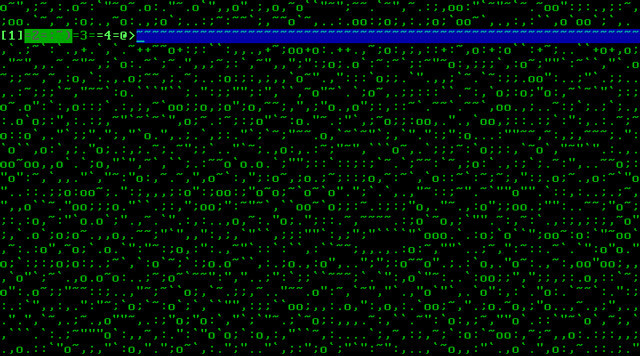 Basically all the "empty space" in the terminal would be filled with the pattern(here I "tile" one of the image from above but I would like in the actual implementation for each individual "blank" to be generated randomly from the set of 5-6 characters and features documented from the montage which would be specified). There is a different pattern for the active command line i.e. wavy "water" but I'd settle for the line being blue. As this was imagined, commands would "erase" the "water" as they get typed on the active line and of course a constraint would be that the pattern of characters never gets interpreted by the CLI otherwise it would make it useless. So is there any configuration exposed in bash or in the terminal framework proper, or a script which would allow to use a set of characters and some control over colors to modify the output of bash in terminal so as to generate a somewhat random pattern for the background (which would be similar to what I've shown above)? Or should I simply settle for something like trying to supply a full pattern image as a background for the tty? Opted to not individually randomize the selection of characters i.e. head -c 1 with the tput cols multiplying the lines to begin with, which would print individual random chars from the quoted selection - because it's too slow. I don't think random generates a (tput cols) long integer but still it's faster. Surely this is all very wasteful but it works. Haven't randomized any color or effect per character or otherwise except for that green because as I explained rendering/processing each char individually is too slow. Re: framebuffer? I would pipe the value to cut -f1 -d";". I can do this on the CLI but making this work inside the sequence of elements in the PS1/P_C variables is out of my reach at the moment and it's possible that whatever command is put in PROMPT_COMMAND may not be evaluated at every carriage return but rather only once(?) despite being executed every time (see observations below). PROMPT_COMMAND="echo -en '\E[32;32m'$(tr -dc ',. :~' < /dev/urandom | head -c $(echo "$[$(tput cols) * 2]"))"
PS1="$(echo -en '\n') $(tput setab 4)$(echo -en "\E[2K")$(tput setab 0)\[\033[7;32m\]df:\[\033[1;34m\] \W @d \[\033[0m\]\e[32m"
/dev/urandom 's randomness seems not so random when called here in P_C. This image is made out of 2 images, but it's easy to pick up that the extra 2 lines pattern is always the same i.e. the randomness is not generated with every enter keypress but only one time for each of the two lines - possibly only the first time .bashrc is read by bash. PROMPT_COMMAND="echo -en '\033[0;32m$(tr -dc ',;o.:~' < /dev/urandom | head -c $(tput cols))\n\033[36;44m$(tr -dc '~' < /dev/urandom | head -c $(tput cols))\033[0;32m$(tr -dc ',.o+;:~' < /dev/urandom | head -c $(tput cols))'$(tput cuu 2)"
What is done with PROMPT_COMMAND is that 3 lines of patterns are printed every time before the prompt is generated - and those 3 sets of patterns are individually generated within the constraints explained in 0.2 - meaningless for the water as it's 1 char but still. Then we go up two lines (using tput cuu 2) and the prompt is generated on the middle line according to PS1. We still have our initial set of command for the full screen pattern on .bashrc load which is executed only once when we log in to the terminal. Now we have some padding around the active line which has its own blue pattern which always gets repeated when there's a return carriage. The contents of the PS1 variable and the P_C have been sanitized. The syntax of the escape sequences and color coding embedded within long echo sequences can be tricky. Errors lead to weird terminal behavior including lines that overwrite each other, a prompt that appears away from the left margin or unusual output to stuff that has been processed unintentionally. A condition exists with what I'm doing, where an extra space is required inside the PS1 variable to counter a visual difference between the linux terminal and lxterm with my setup (Arch Bang). Without the extra space, the linux terminal prints the first character of the prompt at the end of the last line for some reason I can't figure out (of course it's something that I do and not the default behavior). Also can't figure out how to generate some random effect (bold, inverse etc) to the set of chars in quotation marks, as it was decided early on to generate longer strings to increase performance. There is still no real persistence of the pattern outside the padding around the prompt, but at least there's the water and it's simpler than before and somewhat more predictable. Starting to feel that going much further will require either putting all that into a script or leverage some higher form of abstraction. But the terminal capabilities are quite enabling for the end user (reminds me of "logo")! ^set^+^chars^ to implement from pool - here 1,5,b,d,e,f... so_________________________^add the appropriate sed subprocessing units for implemented chars i.e. first one we replace "1" with the value of $Z1 and apply color at the same time, then all the chars move down the pipe to all required blocks - we selected to implement 6 chars here so we have 6 sed blocks. PS1="\[\033[1;36m\] $(echo -en '\xe2\x96\x91')$(echo -en '\xe2\x96\x92')$(echo -en '\xe2\x96\x93')[\t]$(echo -en '\xe2\x96\x93')$(echo -en '\xe2\x96\x92')$(echo -en '\xe2\x96\x91') \[\033[7;36m\]$(echo -en '\xe2\x97\x98')$(echo -en '\xe2\x94\xbc')$(echo -en '\xe2\x94\x80')\W$(echo -en '\xe2\x94\x80')\[\033[0;36m\]$(echo -en '\xe2\x94\x80')$(echo -en '\xe2\x94\x80')$(echo -en '\xe2\x94\x80')@$(echo -en '\xe2\x96\xb6')\[\033[0;36m\]"
PROMPT_COMMAND="echo -en '\033[0;36m$(tr -dc '=' < /dev/urandom | head -c $(tput cols))\n\033[01;46m$(tr -dc '~' < /dev/urandom | head -c $(tput cols))\033[0;36m$(tr -dc '=' < /dev/urandom | head -c $(tput cols))'$(tput cuu 2)"
The screens show the result in the standard linux terminal and it works in xterm too. I've used some of those new pattern chars in the PS1 prompt whereas the PROMPT_COMMAND just takes care of the active line and its 2 line padding which use 1 byte chars. Display is managed by the terminal a software which works the same as a web browser: it interprets character sequences to set the display (see man terminfo). 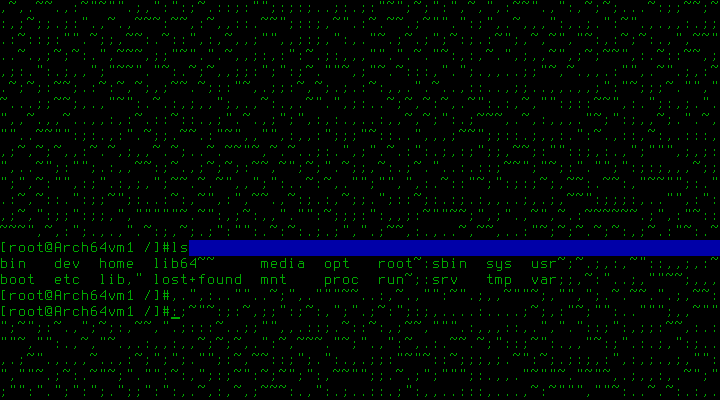 The bash shell will not tells the terminal how to fill the empty region of the screen. 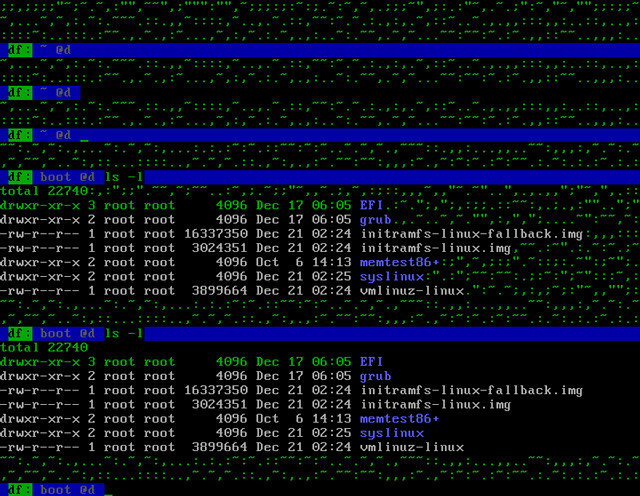 Some terminals are able to have pictures as background like gterm but it is not made by the shell. Whether or not they can be is dependent on the hardware and software one is using. You got a rather 'free' random noise on analogue TV sets when tuned into nothing. However, more important is "why would you want do do something like this?" There are many things in the world that people can figure out how to do, but the larger subset of those things are things that maybe aren't good ideas to try, or are likely to cause more problems than they are worth. The biggest problem that is very evident in your examples above is legibility. The displays with filled in backgrounds are harder to parse, take longer to comprehend are likely to cause more errors in comprehension and understanding. In short, you are wanting to know how to fill the "background" of an information channel with some sort of noise that is not relevant to the purpose at hand. You might compare the results of your research so far to studies in the field of stenography. Burying information in the backgrounds of some other picture is a science -- balancing some need to pass on information with the need to hide it as the same time. If you are not actively trying to do this, you consider that you might be approaching the same end result, regardless of your starting intents. Some people can function having colored text printed over the background of something else, but I'd bet that the extra work to sort out meaning from the background results in slower work and a lower output of the creative effort. Eventually, the background becomes more important than the foreground effort and you and up with a game like "Where's Waldo." I certainly don't see the relevance this has for Unix & Linux -- perhaps this question would b better suited on an exchange for game writing, or possibly stenography? Colorizing your terminal and shell environment? How to colorize output of ls ? Is it possible to view media on the console? How can I prevent execution of part of /etc/profile in my login shell? Heirloom Toolchest tr: error(s) trying to delete the complement of a set containing a multibyte character? Using a variable inside a sequence of commands in bash to supplement an existing string - syntax error or flawed design? How to change the color scheme of the prompt based on user?